This view from the western desert shows the three major pyramids of Giza, looking east (modern Cairo is cleverly concealed behind the pyramids in this photo.) From left to right, and front to back, we see the three small pyramids of Menkaure's queens, in front of the pyramids of Menkaure, Khafre, and Khufu. Menkaure (2532 BC - 2504 BC; Greek name, Mycerinus) was the son of Khafre and the grandson of Khufu. His pyramid is somewhat smaller than those of his father and grandfather. It was originally to have been encased in black granite, but was never completed. 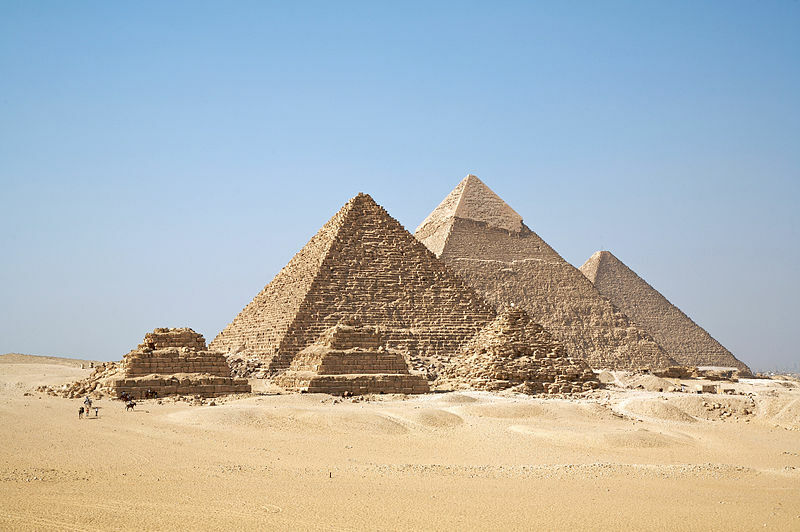 Many pyramids were built after his reign - more than one hundred pyramids are known in Egypt - but none have captured the imagination like the three pyramids at Giza.